SARATOGA SPRINGS, NY – On March 25, 1919, 20,000 men of the New York National Guard’s 27th Division owned the streets of Manhattan. 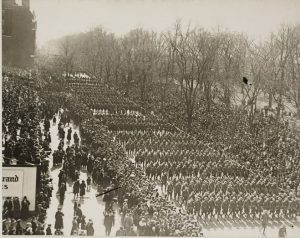 Two million people turned out to see the division march five miles up Fifth Avenue after the soldiers came home from World War I. There were 10,000 policemen on duty – 6,000 regular cops and 4,000 reserves – to control the crowds. Five hundred plainclothes detectives were scattered throughout the crowd to look out for trouble. There was a special grandstand for 500 Civil War veterans and another for 1,000 Spanish-American War soldiers. 6,820 wounded soldiers and sailors who had been convalescing in New York City hospitals lined the parade route. 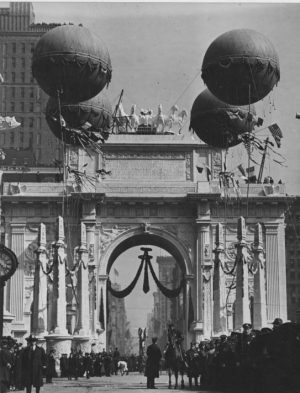 The parade route’s official start at Washington Square featured a massive white victory arch that featured four balloons floating above the road and white pillars lining the route. An arch at 60th Street was covered with crystal glass. Searchlights illuminated the structures at night. The division combined units from New York City with Soldiers from the major upstate cities – Buffalo, Syracuse, Rochester and Albany – along with men from Central New York farms and the Adirondacks. On March 5, 1919, the transport Leviathan, a German ocean liner confiscated by the U.S. government, sailed into New York Harbor with 13,000 Soldiers onboard, 10,000 from the 27th Division. Over the next few days, more troops showed up on other ships. The Biltmore Hotel became division headquarters and troops were at Camp Dix, New Jersey, and Camp Upton on Long Island. Day one involved feeding as many soldiers as possible in the city’s hotels and restaurants and providing free tickets to shows and concerts. Day two was the tremendous parade up Fifth Avenue on March 25. On March 24, the men were moved by train and ferry into New York. 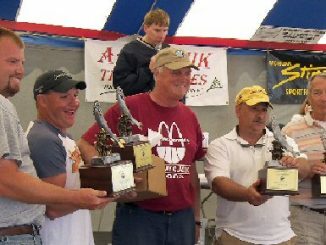 They marched from the train stations and ferry terminals through the streets of Manhattan and Brooklyn and the Bronx – in smaller local versions of the big parade to come – to the massive state armories where they spent the night. On March 25, the weather was clear and warm. At 10 a.m. the parade kicked off. New York City mounted police led the way followed by a caisson – a wagon used to carry artillery ammunition – carrying flowers and a wreath to salute the 1,986 division Soldiers who died in the war. At the memorial to the division’s dead in front of the Public Library, things stopped while the Civil War and Spanish American War veterans lifted a wreath from the caisson and laid it on the alter. Next came the division’s wounded men ferried in 400 cars. There were three to five men in each car, which were driven by female Red Cross workers. 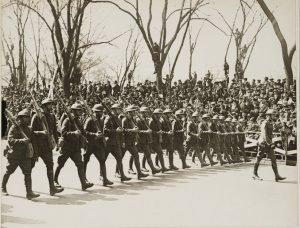 The Guardsmen marched in half-battalion formations stretching across the avenue. They wore their tin-plate helmets – painted green with the division patch on the front – and carried their weapons with bayonets fixed. They carried “light packs,” a gas mask slung at their side and their web belt with a canteen. A detachment of Australian troops marched behind the headquarters company. Their inclusion was a reference to the fact that the Americans and Australians had fought side-by-side in France and Belgium. Also in the parade was a detachment of Red Cross “girls” who marched with their “cocoa cannons,” according to the New York Sun. The “cocoa cannons” were mobile field kitchens the women had used to make and serve hot chocolate to the soldiers overseas. Despite the 10,000 police officers, the crowds got out of control between 20th and 28th Street and swarmed onto Fifth Avenue, the Sun reported. As a result the troops, instead of parading in a company front of 18 soldiers abreast, were squeezed down to squad size. The police reported that 32 people were injured during the parade and that there were two deaths. A police officer suffered a heart attack and a man fell from a rooftop while trying to get a better viewing place. At the end of the route the troops were directed onto trains and subways and started back to the city armories or Camp Upton. On March 26 all the men of the 27th Division were back at Camp Upton. By the end of the first week of April 1919, they were out of uniform, discharged from the Army and the New York National Guard.